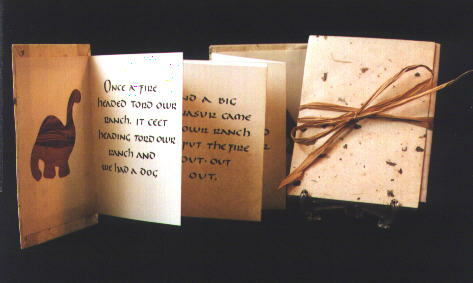 This concertina book is a story by the seven year old daughter of the artist. It is lettered in uncial with black ink then reproduced. The dinosaurs were cut from Turkish hand marbled paper which were done by the book artist. Cover is oriental paper with inclusions, with raffia slip on band. Original was lettered on Fabriano Italia paper. The artist included a photocopy of the daughters precious original story from 1972.